When Apple first announced its video calling application FaceTime on June 7, 2010 at the WWDC event, in conjunction with the iPhone 4, it quickly became apparent that there was a potential trademark conflict with a company called FaceTime Communications. But Apple struck a deal with the company to transfer said trademark over to them, and FaceTime Communications subsequently changed its company name to Actiance. As of very recently, ownership of the domain name FaceTime.com was also transferred over to the Cupertino company. It doesn’t resolve to an Apple-operated website yet, but it’s definitely now owned by the company, as the WHOIS records show. Unlike iPad.com. Back in late January 2010, I wrote that Apple didn’t own a single iPad related domain name. Fast forward 13 months, and they still don’t. Out of Cupertino’s hands, at least for the time being: iPad.net, iPad .biz, iPad.info, iPad.fr, iPad.es, iPad.eu, iPad.se, iPad.cn, iPad.be and iPad.jp. To name but a few. They also don’t own iBook.com, iBooks.com or iBookstore.com or anything like that, in case you were wondering. It’s not that Apple doesn’t care about domain names. It paid heavily for iPhone.com back in 2007, and it owns iPod.com, iMac.com, iWork.com, iTunes.com etc. (but not MacBook.com, curiously). Run a search on UDRPsearch and you will find that Apple regularly fights to (re)gain control over relevant domain names that carry one of their trademarks – which it doesn’t have for ‘iPad’ (yet), just to be clear. Run a search for ipad.com now, and you’ll notice Apple has yet to oppose the ownership of the domain name, even though it now actually does own the trademark (Apple actually acquired the rights to the term from Fujitsu in March 2010). I have no idea why they haven’t made an attempt to claim rights over ownership of the domain name so far. It’s entirely possible that they’ve tried to acquire the domain name directly from the owner, but this person has stopped responding to my emails entirely so I’m unaware of any negotiations between Apple and the registrant of ipad.com (Enero 6 Corp). 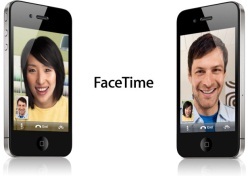 Either way, Apple clearly has plans for FaceTime.com. The timing is, of course, interesting. Later today, the company is expected to unveil the second generation of its popular tablet computer, and it’s likely to boast a front-facing camera for FaceTime video calling. A few more hours, and we’ll know what’s up.